How do I prune the roots of a rootbound plant? 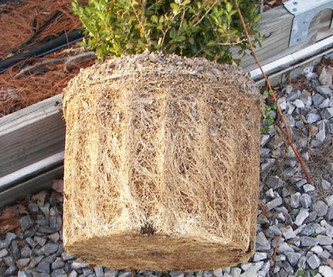 This answer talks about pruning the roots of a plant when it has become rootbound. How easy is it and how do you go about it? Root pruning is typically done when the roots of the plant are all entangled and have begun growing around in circles. Pruning is necessary for the continued growth and health of the plant. Pruning approaches can vary wildly, depending on how badly the plant is root bound, but the essential goal in each case is the same: free the roots! I'll describe two ways of doing it, depending on the severity of root boundedness. Here (see examples below), the plant is just starting to get root bound and the roots outside are mostly whitish (new roots) or thin. This is perhaps the best stage to diagnose root boundedness and do the pruning, as most of the roots can be retained without very heavy pruning. You can start by gently trying to separate out the roots. Try to squeeze and separate or use a tool to shake the soil off. You can also use your fingers to tickle the soil out of the gaps and free the roots. You might not be able to separate individual fibers in the left image, and that's ok. For the picture on the right, you might be able to separate out each of the root fibers. Snip away any tips of the roots that are bunched up together and cannot be untangled. You needn't try to save each and every fiber. The plant can take some pruning and that's perfectly fine. Usually, these spots are around where the pot has protrusions/ridges (see bottom of both images). The picture in the question and the following examples fall under this category. If not pruned immediately, the plant will have serious issues. In these cases, the pruning is generally harsher, as the goal is to first free the plant from being suffocated. For the plant in the question and the first one in the right image, I would take a sharp knife and make several vertical slits (every quarter or an eighth around the base) to cut out the roots that bind it from the outside and be able to pry it open. This is necessary, because the roots have become extremely tangled and have begun going in circles. Once you do that and start freeing up the roots, you'd actually be amazed to see that some of them are a foot to a foot-and-a-half long! After you've freed them and dislodged the soil, take a pruning scissors and go to town on the roots. Trim them down by cutting off the excess length from the mature, thick roots and keeping as much as possible, of the newer roots (these won't be that long, and you can trim the ends). 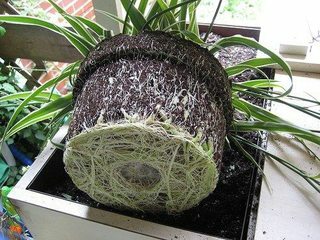 Do this till you bring the root clump down to a reasonable size, with free roots, ready to be transplanted. Although you aren't explicitly cutting the roots in the first approach, as you do in the second, you will hear the thin, young, white roots snap as you pry the root ball open. Do not worry about this; it's bound to happen and the plant will be fine. Remember, some roots have to be sacrificed for the rest of them and the plant to survive. While you can prune the roots aggressively in the second case, do not over do it. In other words, do not leave a plant with just 2 roots fibers, when it had 30 to start with. Scheduled root pruning (to maintain the size) is best done in the dormant season. 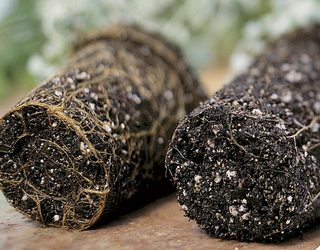 However, if a plant is failing because of the roots, then it's best done immediately (except perhaps, in the harsh winter). Not the answer you're looking for? Browse other questions tagged roots root-pruning or ask your own question. How to deal with very packed Spathiphyllum roots when repotting? Why has my mint plant gone all woody/sparse/stringy? What's the next action I should take with this rootbound plant? 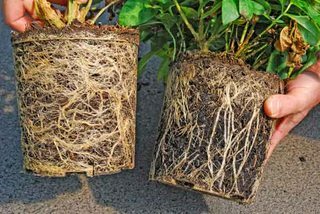 How do I manage roots in a multi-plant planter? Should I remove the tree roots coming from the neighbouring garden? 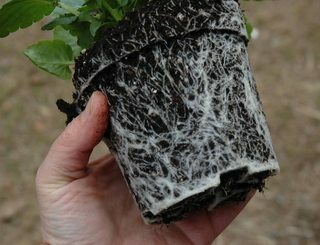 Why should I prune roots of bare root blackberries before planting? Will shaving the top of a Red Maple's roots hurt the tree? If the tree roots must be reduced, is it wise to reduce the crown too?